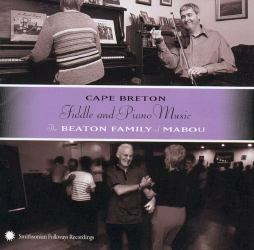 A new CD from the extended Beaton family includes strong performances by fiddlers Kinnon & Andrea Beaton as well as by Glenn Graham and Rodney MacDonald. Betty Lou Beaton plays a piano solo as well. Also included is one archival track of Donald Angus Beaton from the 1960s. The tunes are a mix of old favourites and new compositions ... something for everyone. 15 of the tunes on this CD can be downloaded as a single ABC File. Note: the midi files above were generated from the abcs.